Global superstar musicians could soon be winging their way to the Hebrides to record their next hit album. Bosses at Black Bay Recording Studio hope to attract major stars to “the edge of the world” at their state-of-the art Great Bernera home after signing a deal with prestigious studio agency Miloco. 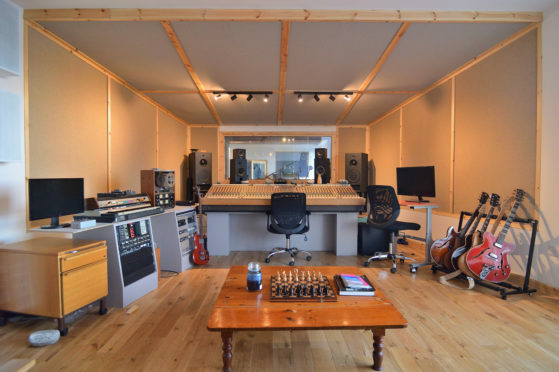 In the last few decades Miloco – which has more than 90 studios across the globe – has had a client list which included the likes of Adele, Coldplay and Oasis. An announcement is being made today confirming Black Bay has been selected by Miloco to become part of their portfolio. Studio owner and record producer Pete Fletcher said: “We’ve only had our doors open for two years and already have a long list of incredible records that we’ve helped into the world and we are very excited about the new relationship with Miloco and the potential they will bring. “We know we have something really special up here, and it’s a real privilege to share it with people. Graeme Allen, of Miloco said: “We are absolutely delighted to be working with Pete and Black Bay studio. “The equipment is up to spec and the space is great, but while this is of course important, it’s the atmosphere and setting of a recording studio that really sets it apart. This is where Black Bay truly excels. “I can’t think of another studio on our roster in such a serene and beautiful environment, and there are few studios across the world more suited to locking yourself away from the noise of the world and allowing yourself to be truly creative. We recently recorded this 'slightly trad' version of "It's True" which was the second single we did with Edwyn Collins producing and released on FP Music Co in 1999. This beautifully shot film was recorded for the Nissan Electric commercial featuring Peter Fletcher at Black Bay Studio. Share, tag your friends and we hope you enjoy this version of an astrid favourite 20 years later! Rachel Mackenzie, area manager for Highland and Island Enterprise, said: ”We are delighted to hear that Black Bay Studios has been added to the Miloco Directory. “The studio will make a significant contribution to the local economy while attracting major artists to a superb location in the Isle of Lewis. We are pleased to have worked with Pete and provided funding support to help bring his project to fruition. Nestled on a sheltered harbour on the shoreline of Great Bernera, the studio found its home in an old crab factory which was redesigned and renovated in 2016. The large building accommodates a huge 100 square-metre “Live Room” with a five-metre high pitched ceiling, together with living accommodation. The owners say it is the “ultimate escape from the rest of the world”, where artists can lose themselves in music. They hope working with Miloco will see some of the most exciting artists from around the world visit the Outer Hebrides to write, record, collaborate and make world-class music. Black Bay has worked already with a myriad artists from all over the UK and internationally, including Tide Lines, Snapped Ankles, False Advertising, Blair Dunlop, Astrid, Tamzene.